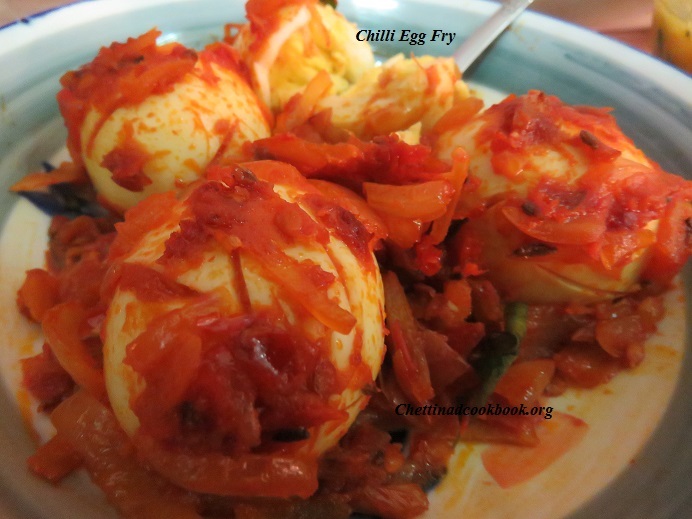 Egg recipes are very simple and hardly takes any time to prepare, innovative cooking is encouraged nowadays to enjoy the home meal. we have very limited choices to go with spring onion. 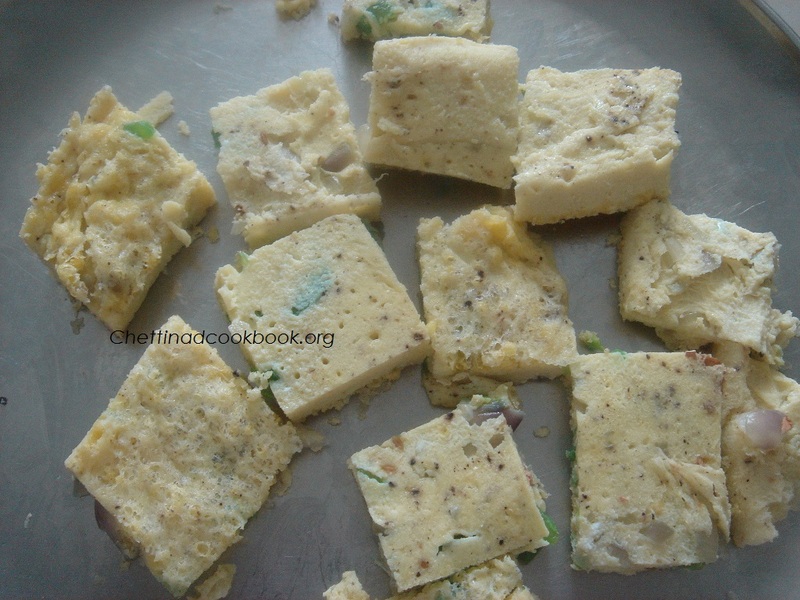 Let us explore more interesting recipe on it. Spring onions add great nutritive and taste value to a dish and can be used in different ways. Spring onions were grown in Chinese gardens 5000 years ago! Do you know the onion bulb was worshipped as the symbol of the universe by ancient Egyptians? 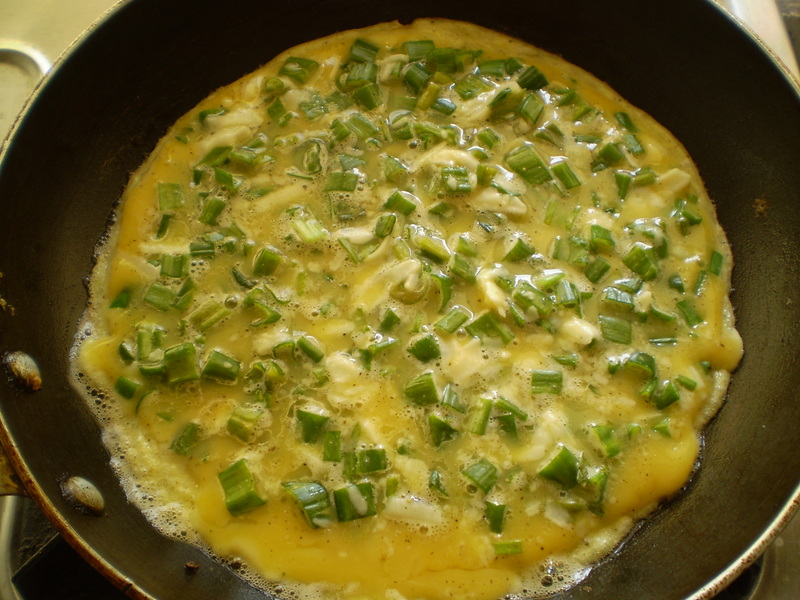 Nutritionally, green onions have a combination of the benefits of onions and greens. They are an excellent source of vitamin K and vitamin C, and a very good source of vitamin A too. Spring onions can be added to dal and make it a much tastier dish. Similarly, you can add it to vegetables like cauliflower and potatoes and it will make an excellent dish. Mushrooms go very well with spring onions and interestingly spring onions can be added to soy nuggets while making a Chinese dish. Spring onions are used in salads as the flavor tends to be milder than other onions. It is used widely in oriental food both as an ingredient and as a garnish. Spring onion is a nutritious plant, and therefore it provides a host of health benefits to us. It is a rich source of vitamins and minerals which aids in curing the various ailments. It is seen to have helped in reducing the harmful impacts of various diseases. – Spring onion lowers the blood sugar level. – It is a support against gastrointestinal problems. 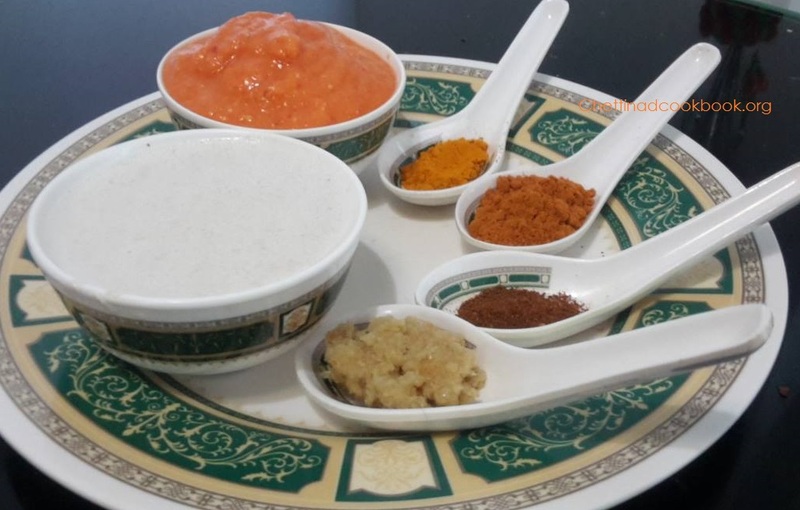 – It is often used as a medicine for common cold. – It is used as an appetizer as it helps digestion. – It speeds up the level of blood circulation in the body. Take a bowl, add egg and beat with the fork to froth forming consistency. Add chopped spring onion, green chili, pepper powder, salt and turmeric powder, mix again gently. Heat the pan, sprinkle some oil and pour a ladle full of the beaten Egg mixture. Sprinkle cheese on it. Turn omelet and cook the other side until golden yellow. 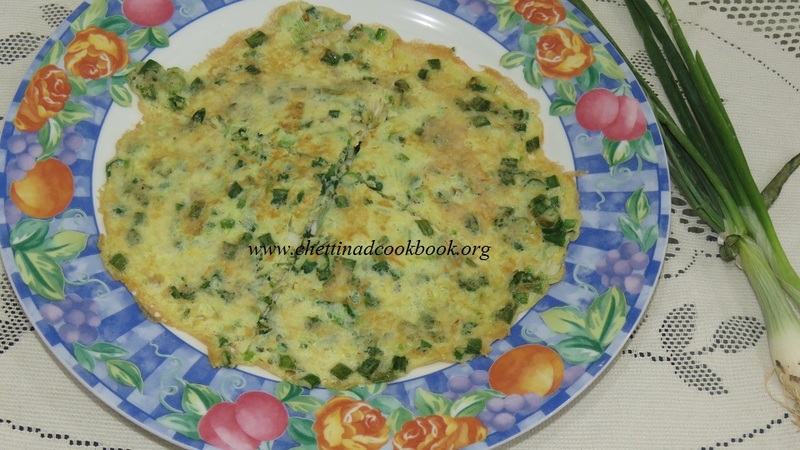 Delicious Spring onion omelet is ready to serve. Roasted Eggs hardly takes no time to prepare. Makes your cooking more simple and worth by its appearance which relishes your meal. Most of us used to dispose of the yolk, But should you eat egg yolks? The short answer is: Yes! The yellow stuff in eggs contains many important vitamins and minerals that are beneficial to your health. Egg yolks contain nutrients like lutein and zeaxanthin, which are important for your eyes. They also contain choline, which is good for your brain and nerves.If you only care about protein, egg whites are a great food. You can buy them pre-cracked and pasteurized in cartons at your grocery store for easy cooking. Some people even add them raw to smoothies. The white generally contains 4 to 4.5 g of protein and only around 17 calories, making it an excellent part of a healthy diet. 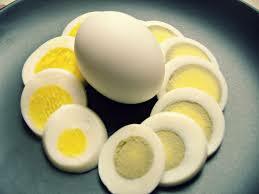 Eating egg whites in combination with egg yolks makes the whole egg a nutritional powerhouse. 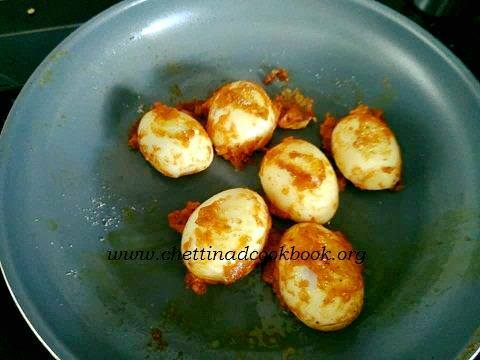 Boil eggs for 5 minutes in a medium flame peel its shell and slice it as shown below. 2. Heat pan add a teaspoon of oil, drop all the above-mentioned ingredients except eggs. 3. Sprinkle some water, mix all the ingredients caution: cook in low flame. 4. Place the boiled egg slices on the pan such that masala sticks to the egg on cooking, allow it to get roasted for 3 minutes in low flame. 5. 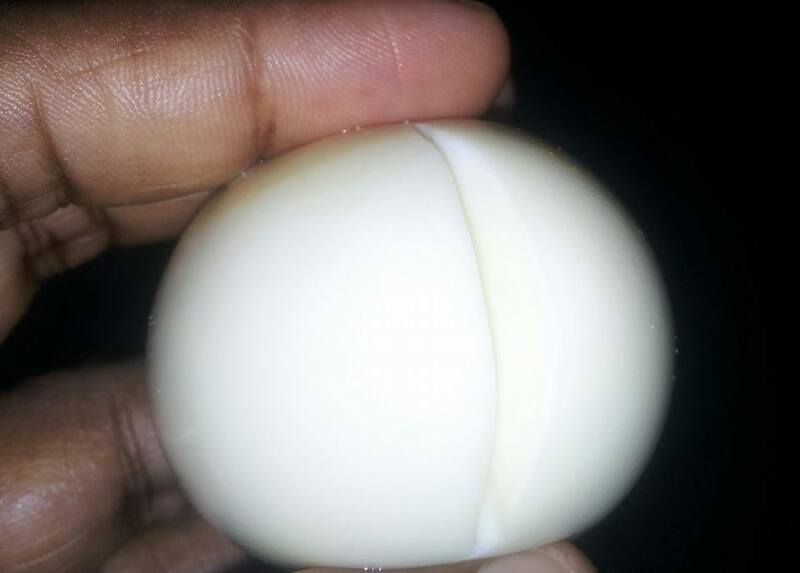 Carefully turn the egg slices to the other side to get roasted on both the sides. 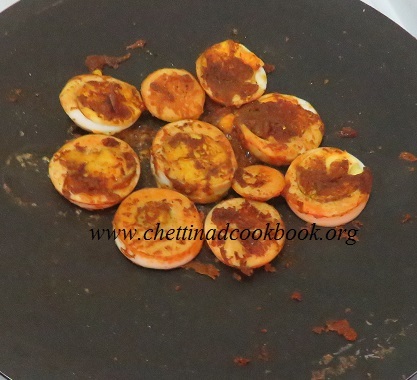 Well coated masala on egg slices are ready to serve. Enjoy the complete taste of Egg roast. It is made in a small ladle which we use to temper spices in cooking. 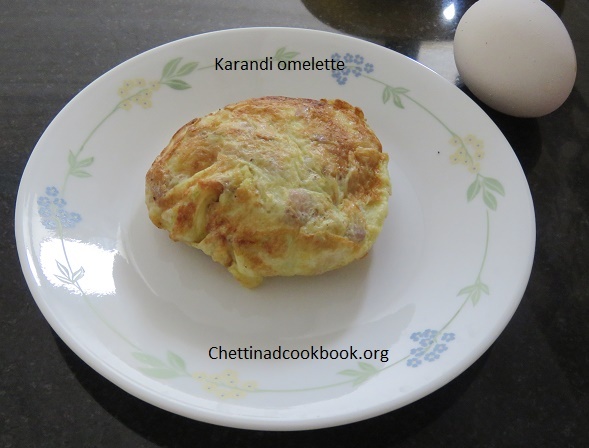 Karandi Omelette is thicker and soft in the center and crispier outside. It is a healthy filling snack or breakfast. Usually, chopped onions are added to enhance the taste. 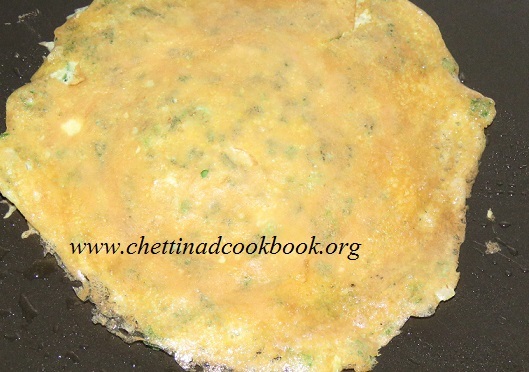 Any vegetables or finely chopped mushroom can be added along with the chopped onion.The recipe is quite simple, done in a small ladle-shaped pan. This gives you the shape of an egg. 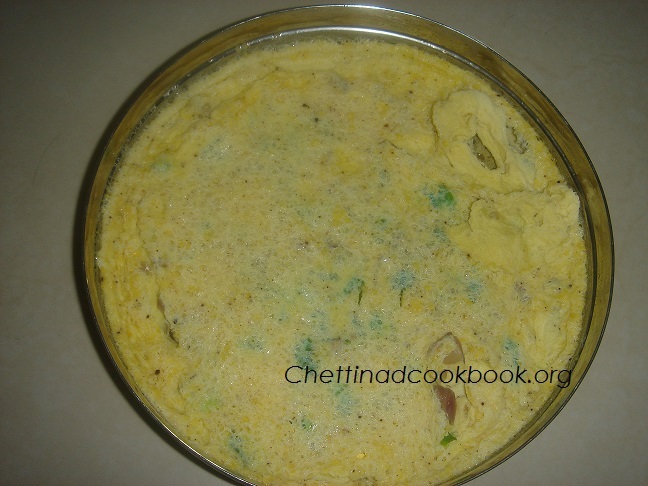 This mixture can be cooked in Kuzhi Paniyam pan to get mini karandi omelet. Take a bowl beat egg, add salt, pepper, and turmeric powder beat well again. Add chopped ingredients mix well. 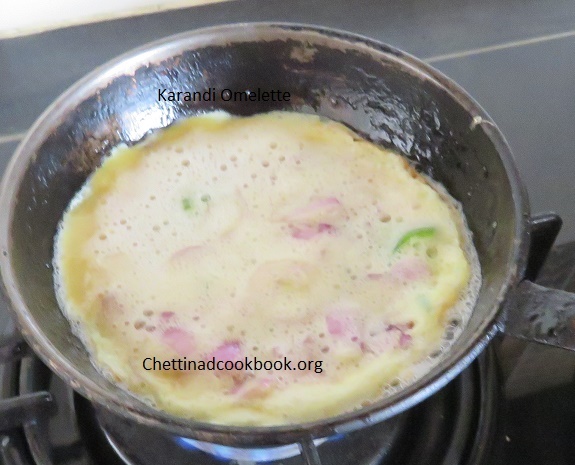 Heat Karandi(pan) add 1 teaspoon of oil, once heated pour a ladle full of egg mixture, wait for a while to cook. It should become golden brown on its edges, turn other side and cook for few minutes in low flame such that the outer part as crispy and inner part get soft. 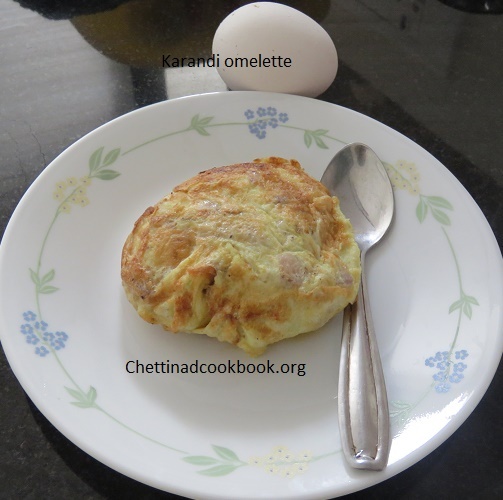 Delicious Karandi omelet is ready to serve. This Creamy delight is awesome with Roti,Naan Parotha Chappathi and Poori,even with fried rice. 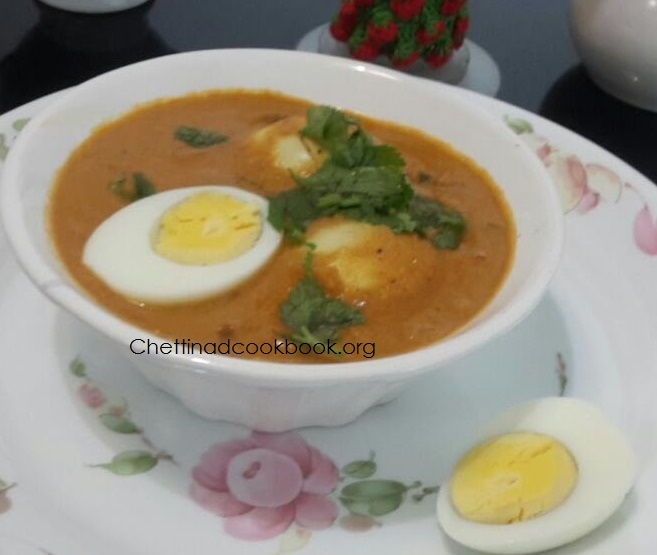 I changed my mood to prepare something different with out Vegetables,Creamy Egg Curry is delicious gravy made with regular kuruma Ingredients ground to a smooth paste and seasoned with hard boiled Eggs.Mild spices added in it is good for summer season. 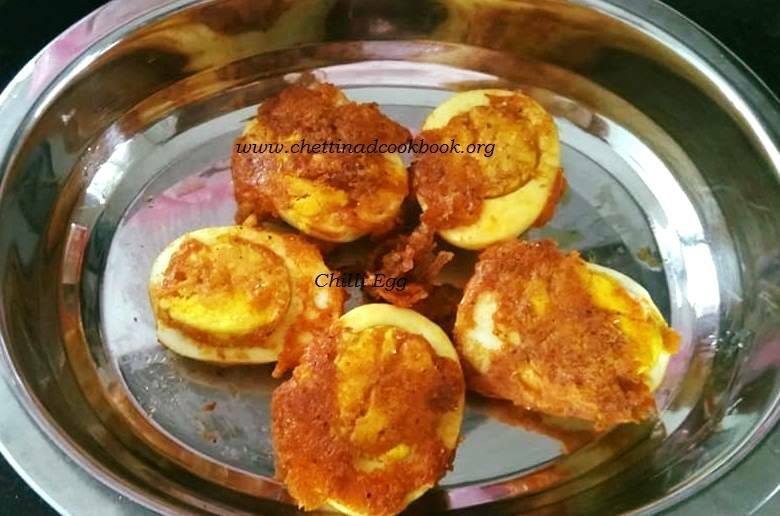 Set the Ingredients ready, with grind masala and boil peeled Eggs.Preparation is very simple,few minutes are needed to complete this tasty dish. Soak Poppy seeds and Cashews in hot water for 15 minutes, to get smooth paste. Fresh cream or curd is optional I have not added any. 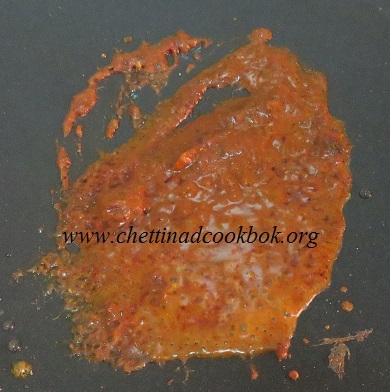 1.Heat Pan with oil add few fennel seeds,add Ginger garlic paste,chopped Onion and curry leaves saute well. 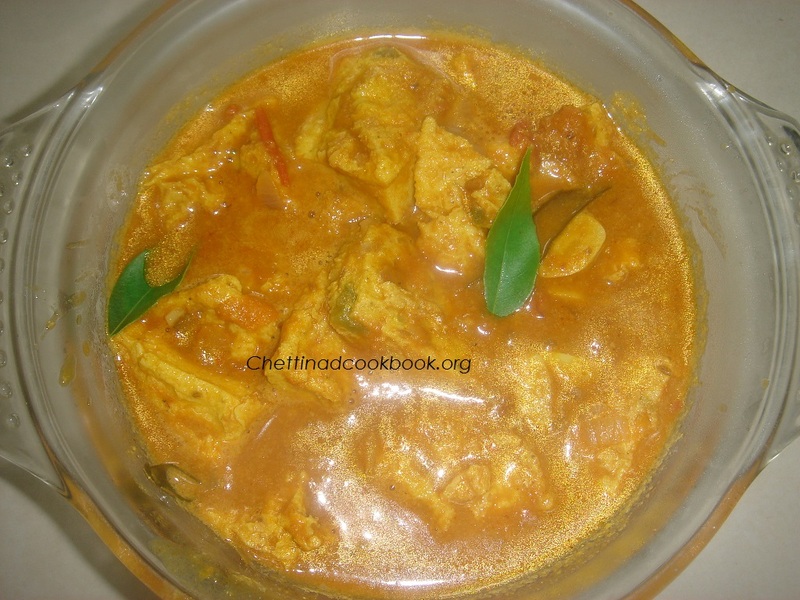 2.Add Garam masala powder,sambar masal powder and Turmeric powder. 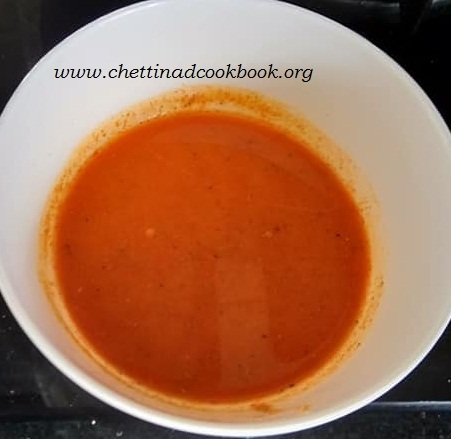 3.Follow with Salt and Tomato puree,stir it well till raw smell vanishes. 4.Add Ground white cream paste to it and water one cup,let boil for 10 minutes in low flame. 5.Finally break one Egg and carefully drop in to the boiling gravy,do not stir for few minutes, allow it to cook in low flame for at least 2 minutes turn gently. 6.Make a slit on Hard boiled Eggs,so that egg absorbs the gravy well. 7.Now add hard boiled egg to this gravy let it boil for a minute or 2. Transfer to a serving dish garnish with chopped Coriander. Note: If you are not comfortable skip step 5 and proceed other process. 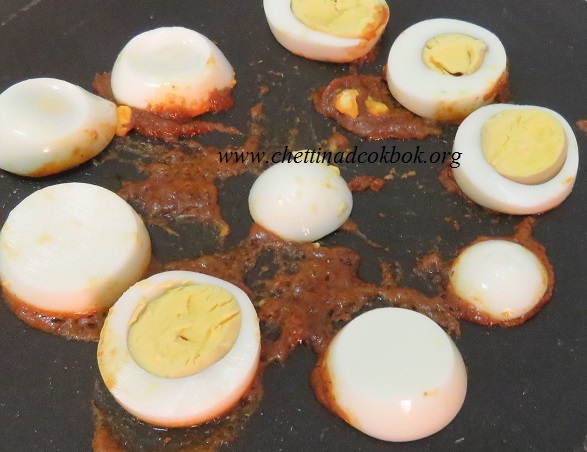 Normally we make Egg curry with boiled eggs or Eggs directly in to boiling Gravy, This is different from both and never gives any stinky smell after meal.This observes gravy and gives complete taste of spices and salt added in gravy . Grease wide pan with 1 tsp of oil keep aside. Beat egg with all given Ingredients above mix well . Now pour it in greased pan , boil water in another pan place this and steam cook for 4-5 minutes. Allow it to cool and cut in to cubical shape or desired, remove and keep aside. Tamarind extract gooseberry sized tamarind. Then chopped onion and Garlic saute well now add tomato and Salt cook until it becomes mushy. Add Turmeric powder , Sambar powder, and Tamarind juice add 3 cups of water allow it to boil for 3 minutes now add ground paste and boil for more 3 minutes. Yes!! 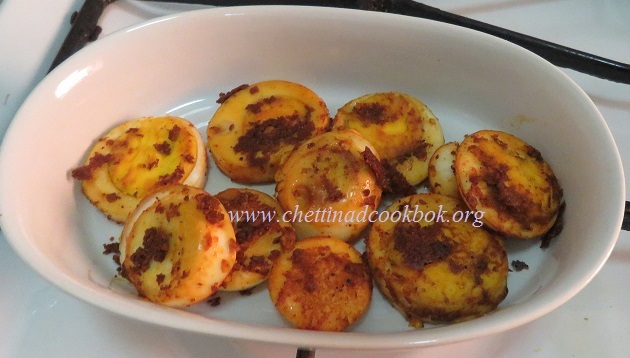 now time to add Beaten egg cubes add it and allow another 2 minutes to observe in medium flame,G ready to serve with plain rice or with fried rice.